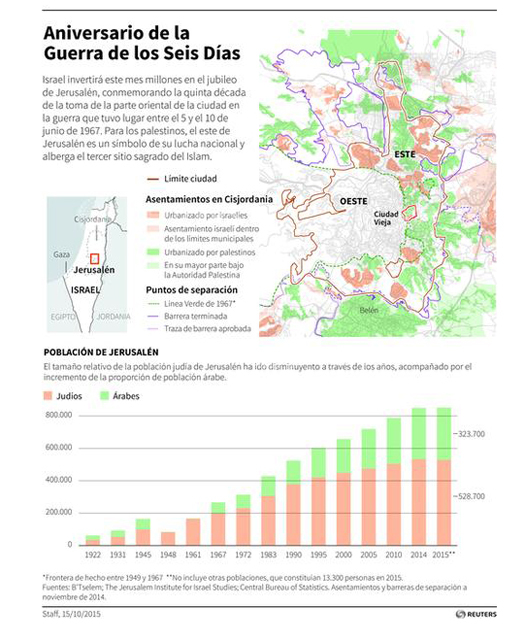 Reuters marks the 50th anniversary of the Six Day War with an infographic in English, French and Spanish which explicitly states that east Jerusalem “is home to Islam’s third holiest site,” but which ignores the fact that the area is also home to Judaism’s holiest sites. The Temple Mount is Judaism’s holiest site, and the nearby Western Wall is the holiest site where Jewish prayer is permitted. 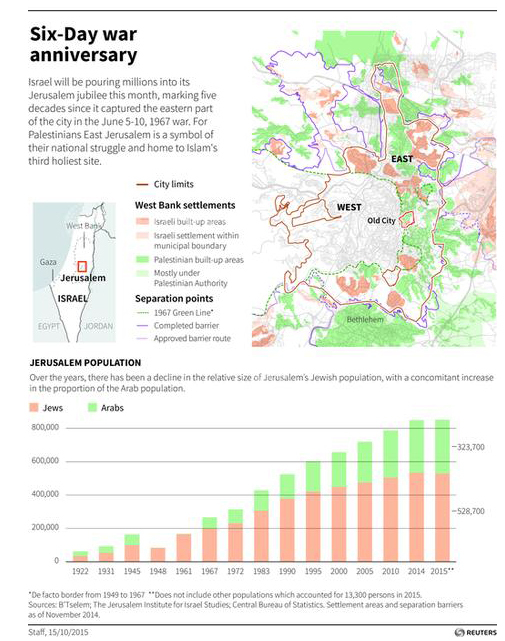 But the Reuters graphic does not make clear that the figures it provides for 1948 and 1961 only reflect the number of Arabs living in the Israeli-controlled part of Jerusalem. The heading refers only to “Jerusalem population,” without any qualification that during the years of 1948 and 1961, the terms were changed. 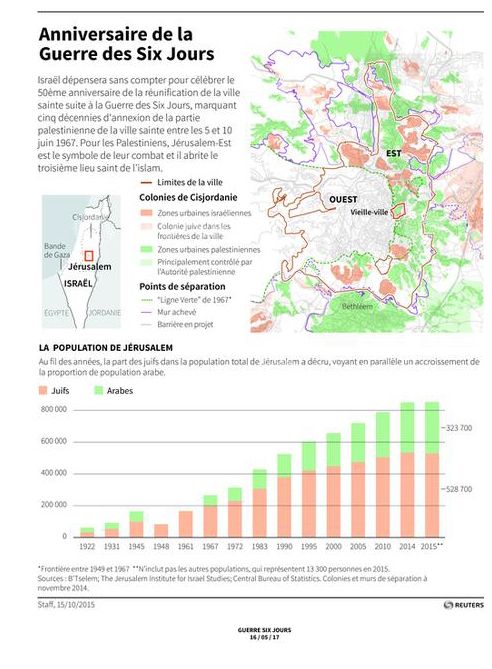 News consumers would wrongly conclude from this that no Arabs lived in Jerusalem in 1948 and 1961, when in fact over 65,000 Arabs lived in the city during those years, when the eastern part was under Jordanian control. CAMERA’s Israel office contacted Reuters about these issues, and as a result Reuters commendably issued this corrected graphic. For Israelis, all the of the city is the eternal and indivisible capital the Jews prayed for through 2,000 years in exile, home to the Western Wall and Judaism’s holiest site. 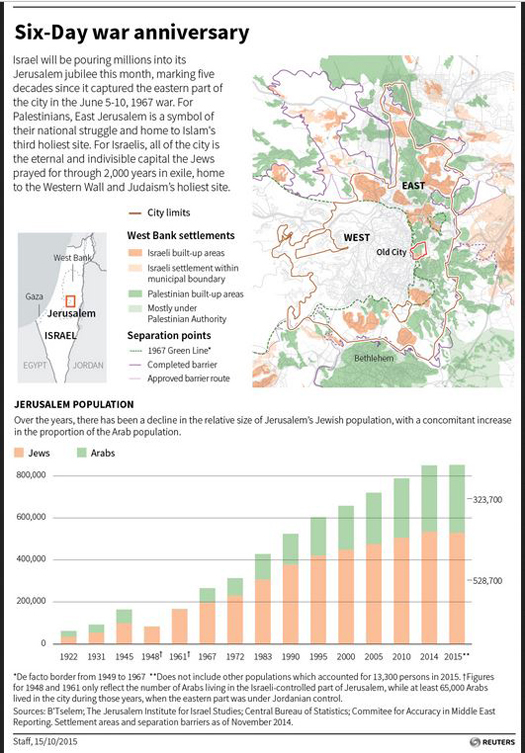 Figures for 1948 and 1961 only reflect the number of Arabs living in the Israeli-controlled part of Jerusalem, while at least 65,000 Arabs lived in the city during those years, when the eastern part was under Jordanian control. Finally, Reuters added CAMERA as one of the sources of information for the graphic. The corrected English image has replaced the original, misleading graphic in Reuters’ images archive. The original erroneous Spanish and French versions have been apparently been removed. The updated, corrected graphic does not yet appear in those languages. This post was updated at 5:48 am EST to reflect the fact that Reuters replaced the erroneous English graphic from its archive and removed the skewed French and Spanish versions.